Vindaloo is a spicy Goan curry which mostly made with chicken and pork or mixed veggies.I had chicken vindaloo in restaurants with flat bread and rice. 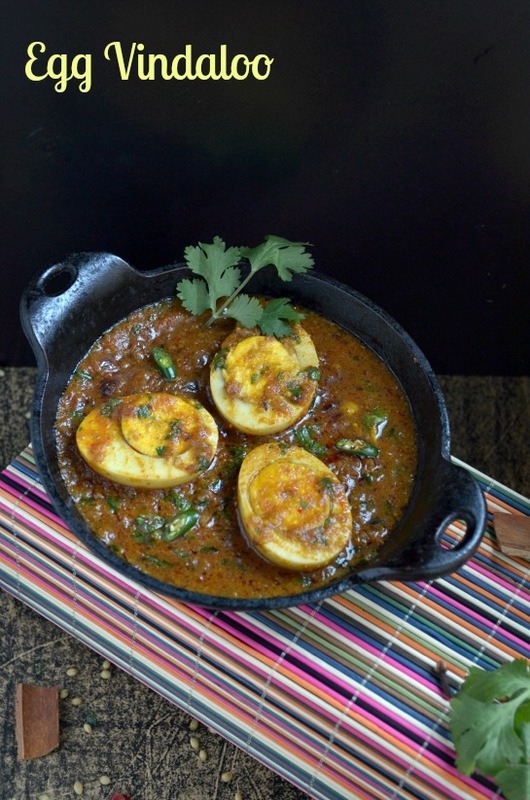 For the day 2 of Blogging Marathon #26 under the theme Goan cuisine I wanted to try the vindaloo with the eggs instead of chicken or veggies. Boil the eggs and halved it and grind the ingredients given, to a fine paste with water and vinegar,keep it aside. Heat a pan with the oil crackle the cumin seeds then add the cinnamon,black pepper,cloves.Add the onions and green chilly,saute till transparent.Then add the ground paste and fry it till the raw flavor vanishes. Now add the chopped tomatoes,cook till mushy.Add a cup of water and salt,cook it till it becomes thicken. Now add the boiled eggs and cook it for 2 minutes,finally add the chopped coriander leaves,mix it gently. Egg Vindaloo is ready. Serve it with roti and rice. This same recipe can be made with chicken and mixed veggies even soya nuggets can also be used. After adding the eggs gently mix it otherwise the yolk will separate from the white. Add the tomatoes after the paste is completely fried and the raw smell vanishes. Check out my blogger friends recipes participating in Blogging Marathon#26. Tantaziling and very catchy vindaloo,omg wish i live near you.. Lovely capture. Picture looks so very nice..I like how you have given that rustic look Nalini..
great pictures & presentation. 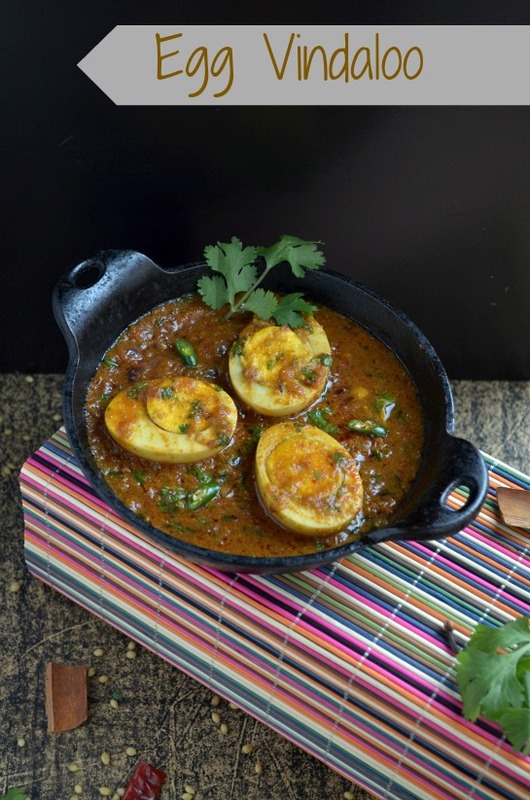 The eggs looks so stunning & vindaloo is one of my fav recipes. Nicely clicked and presented dear. This is regarding the Only Series. You had agreed to host the event for March, are u still available for that? Pls send me your reply to cookingoodfood@gmail.com. Curry sounds so spicy n finger licking good, would like to tey this with chicken, inviting pics! beautiful clicks dear.. love this hot curry with rice..
That gravy looks so tempting dear..
Beautiful clicks, the bowl is so nice and so is the presentation. Egg vindaloo looks delicious. Lovely clicks.